Books. / Coping with cancer. HERE ENDED ONE OF THE LONGEST DAYS OF MY LIFE…. After a long four and a half operation, too my great relief. Michael came back to High Dependency unit last night about 9pm. He looked good, his colour blood pressure etc were all fine and his only sleepy comment was “Tired”!! The surgeon had spoken to me about what had been done. and I cried with relief when he left the room. My daughter had come to give me moral support, she cried too. This had been one of the longest days of my life. Imagining worst case scenarios in my head, which I can’t even bring myself to write. I have been overwhelmed by blog and FB posts, prayers, emails, texts and messages of support. Thanks to everybody. It really helped and meant a lot. As I am doing a lot of sitting around waiting, I thought I would do a blogpost about books. I love books. I have always been an avid reader and usually have two or three books on the go. I am a very fast rEader, I “scan ” pages, but I like to savour books. I hate to finish them. I miss the characters and the curiosity about the plot. I can loose myself in a book and I don’t like to wake up to reality when they finish. Currently I am reading Douglas Kennedy. “Five days“. 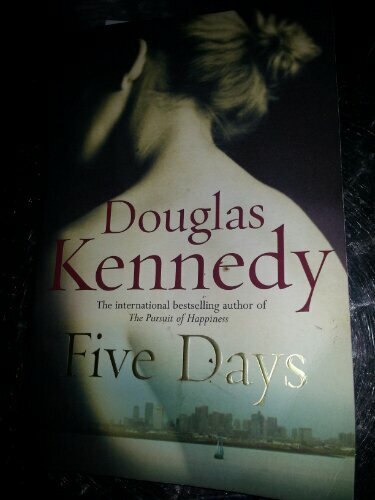 Douglas Kennedy is one of my favourite authors. The theme in his book is usually the same. The protagonist is usually having some sort of mid life crisis, often a writer and is running away. My favourite is the first I read. “The pursuit of happiness”. an epic story, flashing back to the 1940’s 1950’s in the Mcarthy era, It is a love story and a story of moral dilemmas. Of course I had to read. “Woman in the 5th” set in Paris. It is a fascinating story and great to identify all the locations but then toward the end it is as if he ran out of ideas. Went away , came back and finished the book as a completely different story. My other current book, I am reading on my phone is “ Life after Life” by Kate Atkinson. My absolutely favourite author. I love how she will tell a story on the very first chapter and then switch to a story about an insignificant character from the first chapter and so on and so on. Eventually all these stories will link up and there is always a twist in the end. I have greedily read all her books since my stepdaughter introduced me to “Behind the scenes at the museum” set in York where she grew up. My favourite has to be “When will there be Good News” where I first met her anti hero private detective Jackson Brodie. Since then they have made a TV series, “Case Histories” the title of another of her books, where they blended the plots of two books together. Series two is out soon. When I first started reading “when will there be good news?” I realised she had taken the plots from real life dramas that had been in the news recently. A seemingly unprovoked murder of a mother and child in the countryside. a train derailment, a rejected husband at a childs birthday party. and so on. But nevertheless I could not put the book down. a year ago today we were in Tallin Estonia on our travels. Tags: books, cancer, family, relationships.. Bookmark the permalink. Previous post ← WAITING, WAITING………. We love you, Denise – and we are here rooting for you and Michael. Wonderful news Denise and such a relief for you. Hope Michael is soon home and on his way to a good recovery. It was good reading your views on books, these are two of my favourite authors. I really enjoyed the Pursuit of Happiness and like you found the ending of Woman in the Fifth a bit lame after reading the rest of the book. I haven’t read Kate Atkinson’s new book yet but I’m looking forward to it. The new Case Histories series starts next week I think. My favourite Kate Atkinson books are Behind the Scenes at the Museum and Started Early, Took My Dog. I’m also a great admirer of the late Maeve Binchy. What a co-incidence that we both like the same authors!…..We have never discussed books have we? Looking forward to the new case histories series. I have seen the flyer. This is great news! I will continue to keep you and Michael in my thoughts and prayers. I will be in Tallinn in July. Just watched the movie The Singing Revolution about how the Estonians gained their independence – very uplifting. All the best to your and Michael as you continue on this journey. Hi Janet. Thanks for your thoughts and prayers. Hope you enjoy Tallin. The story of the “singing revolution” is a wonderful one. If you click on the link and you will find all my reports from Estonia and Helsinki. We caught the ferry over to Helsinki and spent a couple of days there. Hi Bossy. Thanks for your post. It is strange having the house to myself. I don’t think I have ever spent a night alone here in all the years I have lived here. No housework ir cooking , just visiting twice a day. So plenty of time to relax. I am always surprised at the international appeal of Kate Atkinson.